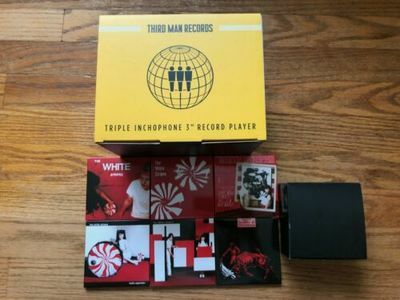 Extremely rare 2019 box set of six White Stripes 3" vinyl singles AND unique Crosley 3" Third Man branded Inchophone record player. The player, box and singles were ONLY available as a limited edition at the Nashville and Detroit Third Man Records stores on 2019 Record Store Day. The singles are brand new and have never been played. The record player has never been removed from the box. All packaging elements are also new and unused. Frank Ocean Blond Double Vinyl LP. Brand New. Rare Record.